On the last hand of Level 12, Wilton Alejandro and one challenger get all their chips in the middle, with Josh Prager entering as well to put both players at risk for their $1,100 tournament lives. Prager has Ace_Jack to Ace_Seven for Alejandro and the shortest stack sits with Pocket_Fives. 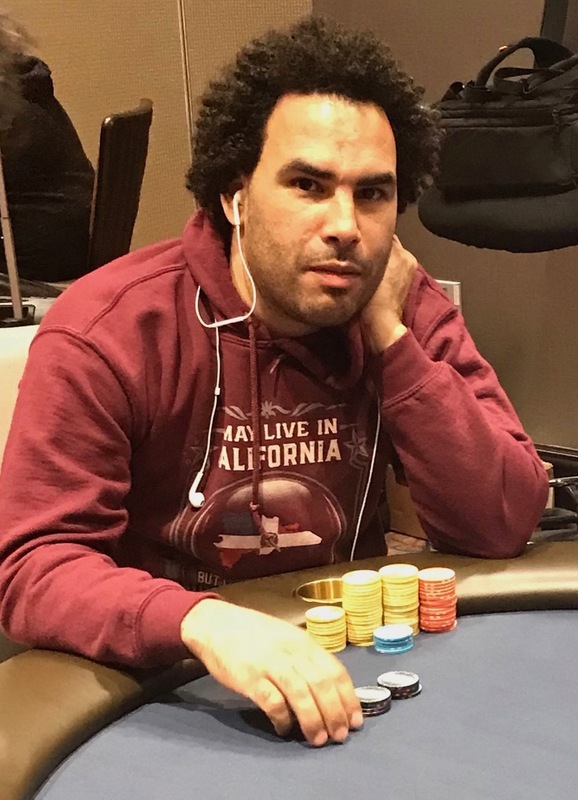 Alejandro (above) flops trips and holds to eliminate one player and get a full double from Prager. Alejandro moves to 110,000, with Prager falling to 10BB. Prager picks up Ace_Jack again a few hands later, gets it in against the Ace_King of Hollywood Lennon, and Prager flops a Jack to keep in the event.